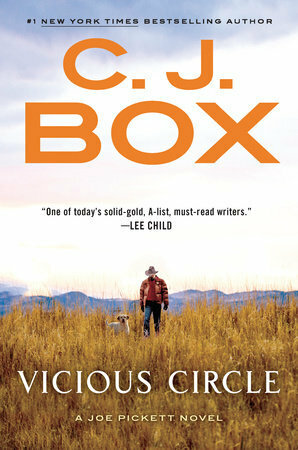 If you feel like getting out of the urban jungle and into the countryside with your crime reading, then CJ Box should be near the very top of your to-read list. He's won the Edgar Award for his outstanding standalone Blue Heaven, but the spine of his terrific authorial oeuvre is his long-running series starring Wyoming game warden Joe Pickett. Pickett is the inverse of many standard crime heroes, and not just because he lives and works in the wide open landscapes of Wyoming rather than hunting killers down a big city's mean streets. He's a happily married family man, who isn't particularly ambitious or driven. He's a bit of a Boy Scout, you could say, in the way he acts - always trying to 'do the right thing'. He also isn't tortured by events from his past (though as we progress through the series - Vicious Circle is the seventeenth Pickett book - there have been plenty of tough times and dark events added to Pickett's resume). And he's not particularly capable, physically. A modern cowboy, but not an action man. Just a fairly ordinary, but honourable, guy trying to do his job and live a life he loves, as best he can. Messing up plenty along the way, but always keeping going, trying to do the right thing. That's what makes him so special, and not at all ordinary, in the world of crime fiction. In Vicious Circle, troubles from Pickett's past do rear their ugly head. First, there's the not-particularly-wanted return of his abrasive, condescending mother-in-law Missy. A woman who when she's not improving her bank balance, husband by rich husband, is determined to undermine Pickett and ensure her daughter Marybeth knows how much better she could have done, with anyone. But worse than that, Dallas Cates is back in town. Former rodeo star, and former boyfriend of Pickett's middle daughter Ruby. An abusive, entitled man used to getting what he wants, and still seething about what happened to his family the last time he duelled with Joe Pickett. Revenge burns. This is an enjoyable read in an excellent series, an instalment that's full of action, with Pickett and those he loves under extreme danger from some particularly vicious people. There's some real moments of vulnerability for the Pickett family, and Box ratchets up the tension in a way that tugs at the emotions. Long-time fans will enjoy the ongoing arcs for characters we've come to know and love, as well as the return of Nate Romanowski, Pickett's falcon-training best friend. A best friend who more than makes up for Pickett's relative lack of talent when it comes to guns and violence, who has Boy Scout outdoors skills, but less Boy Scout in his moral code. Engaging, and enjoyable. A very good read in a superb series.